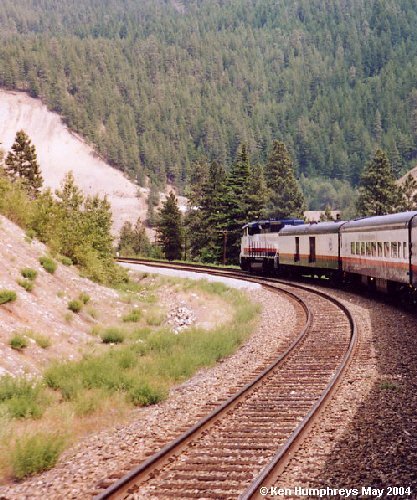 Rocky Mountaineer Railtours operates a passenger train between Vancouver, British Columbia and Calgary, Alberta along the Canadian Pacific Railway line. Another Rocky Mountaineer train operates along the Canadian Pacific line from from Jasper, Alberta to Vancouver. 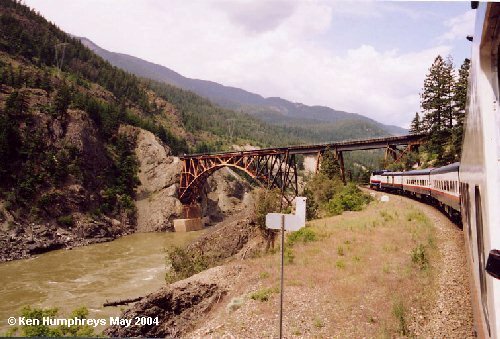 Both trains follow the Fraser River from Vancouver to Kamloops using the CP line eastbound and the CN line westbound. 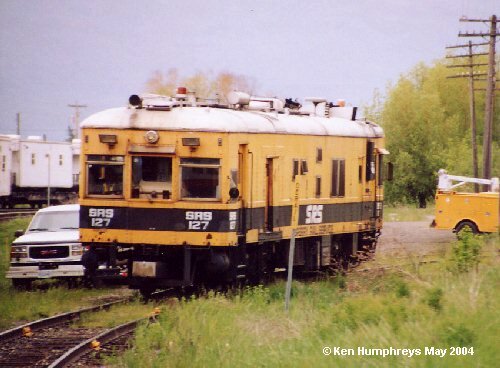 CP built its line 30 years before the CN line picking the easiest route and bridging the Fraser River at Cisco. When CN built its line, they had to do so on the opposite side of the Fraser and also had to bridge the Fraser at Cisco. Today, both roads share trackage going eastbound on CP tracks and westbound on CN tracks. The Rocky Mountaineer trains are unique in that they operate only in daylight so that passengers can enjoy the beautiful scenery through which the trains pass. 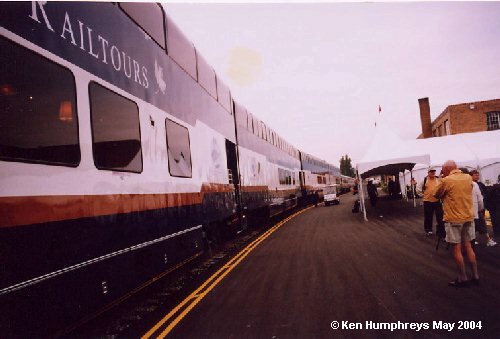 All trains stop for the night at Kamloops, BC and passengers are housed in hotels there overnight before setting off for their final destination (Calgary, Jasper, or Vancouver) in the morning, a rather civilized thing to do in the eyes of rail buffs. 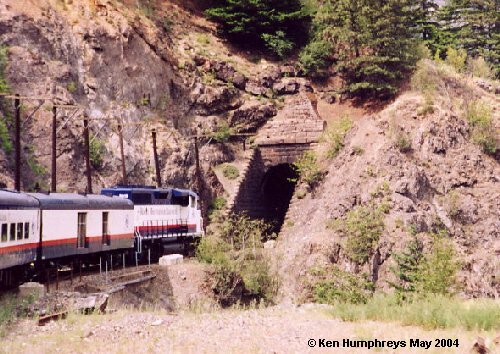 The photo sequences below depict some of the sites to be seen along the Fraser River Canyon and the CP line from Kamloops to Banff on the way to Calgary. Also see our pages on the Spiral Tunnels and Craigellachie. 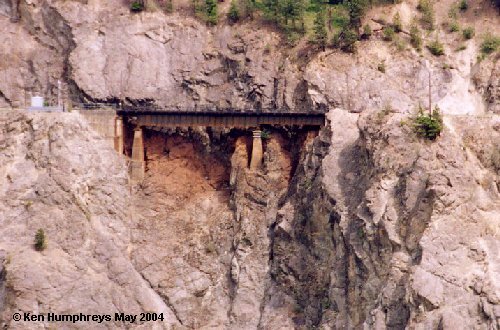 The photos here, with the exception of a photo of the Calgary CP station, were taken in May 2004 from the Rocky Mountaineer eastbound to Calgary, Alberta. Click on an image below to see its full sized version or a photo sequence of related shots. Hit your back button to return and view the next photo. The photos appear on two pages. All images are copyrighted by Ken Humphreys. Looking across the Fraser River at a CN plate girder bridge clinging to the cliff face. Notice the rust staining on the rock under the bridge.